A play with a cast of three leaves nowhere to hide and David Hare’s ‘Skylight’ currently enjoying a successful revival in the West End is no exception. I have to admit I went with my sister who had seen the original run starring Michael Gambon and Lia Williams at the National in 1995. My sister was very enthusiastic about the original and was not disappointed by this version either. 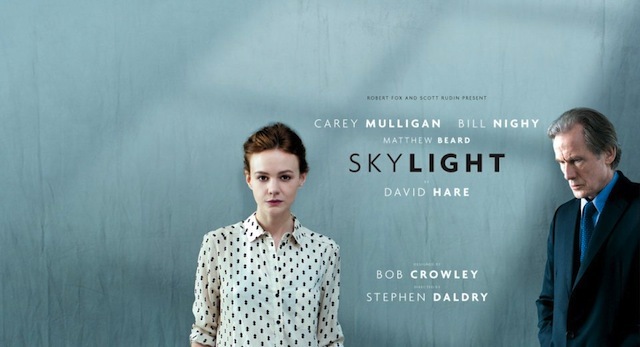 I did have my reservations about Carey Mulligan (playing Kyra Hollis) as it is not always a simple shoe-in for a successful movie star to return to her very early theatre days, and this was also her West End debut. She was good as Kyra, but the whole performance caught fire with the over-the-top, florid entrance of Tom Sargeant played by Bill Nighy and the electric interaction between these two mis-matched old lovers. Skylight set interestingly shows more of the balconies of the overlooking flats when the centre walls are pulled back. Sometimes a revival feels dated and out-of-step, but sadly this play’s themes of social imbalance between those who appear to have everything and those who are impoverished, resonates even more strongly in 2014 than in the 1990s. And, Kyra’s passionate speech supporting the efforts of social workers received a spontaneous strong round of applause at the performance we attended. Although it is essentially a play about serious issues it is also very funny with spiky, amusing lines delivered with exquisite timing by Bill Nighy. All in all an engaging experience at the theatre. 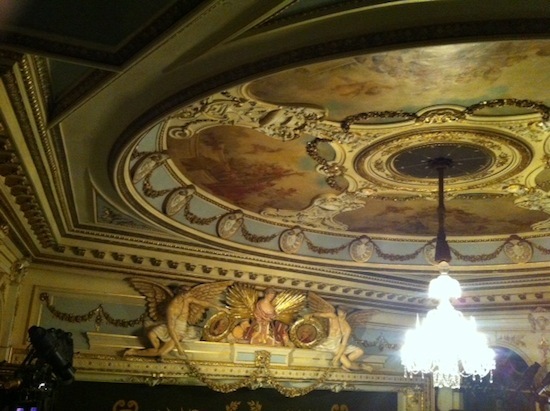 Just a little afterthought – during the interval whilst sitting admiring the fine late-Victorian ceiling I remembered that I’d also seen Caryl Churchill’s ‘Serious Money’ in this very theatre in 1988. 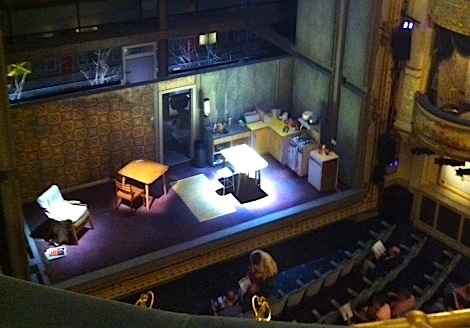 Another play delivering a commentary on our unequal society, but in a more deliberate brash and satirical form. The depressing conclusion is that in the intervening quarter of a century gross inequality has not lessened and, if anything, according to the numbers people, the gap between the super rich and the rest of us is widening. I should have gone to see this at the cinema, when they broadcast it, but alas no. I have seen most of the NT Live broadcasts but these days there’s so many theatres getting in on the act that it’s all very busy and crowded and less special. I haven’t been to a cinema screening ‘event’ yet, but my sister said they’re quite good. I was wondering what do you think they are most like – a slightly removed from the theatre experience, or more like watching a film, or perhaps more like watching telly? ‘Cos I don’t know how much you’ve paid for tickets, but they are about three times the price of a film. I had to check prices then as I would have said twelve pounds, and I think that would have been right, but I see they’ve edged up to fifteen now! Not impressed with that. As money is an issue I used to walk the 50 minutes to the cinema in advance just to avoid the 75p internet booking fee! It’s not like a film, and it’s not like sitting in a theatre. It is closer to theatre as the “live factor” is a big thing and you can feel it. I saw Derek Jacobi in King Lear and for some reason something went wrong at the start of the second half (I think) as they stopped the whole play and then started from that scene again. It is multi-camera and close-ups, but it’s well-rehearsed and flows very smoothly. We also get introductions as well as behind-the-scenes bits and interviews on occasion too. The main benefit though is that it does allow us, up here and elsewhere, to see the best proper theatre. I have been told that in the Manchester Theatre there are ten pound tickets, as a few are released on the day, but that would cost me £5 just to get to Manchester in the hope of getting a good enough place in the queue. The other theatres around here are very audience-led in that they only put on what they think a local crowd will turn up to. So it is a good thing. Just not sure at that price. Thank you so much for that. I was very interested to see about the camera work and the close-ups. I should imagine that top actors like Derek Jacobi are very good at fine-tuning their performances knowing there’s a camera on them too. We do have a theatre here in Norwich, it has does put on a wide range of productions, but mostly not my kind of thing. The best work I’ve seen there was Freiburg Opera’s ‘Tannhäuser’, my father took me otherwise it would have been way out of my budget. The disappointing part of the evening was the fact that the stalls were not full by some way. Not sure if Wagner is too much for the local audience or just too expensive. As theatre tickets, travel and hotels in London are also expensive I think it’s a good idea to show live performances at the cinema. It’s definitely a bit more ‘democratic’ don’t you think! Ooo yes – I do hope it goes to New York – you will love Bill Nighy in this – he really is charismatic on stage. Next Next post: I survived the tail end of hurricane Bertha! Agnes Ashe Blog at WordPress.com.